JAM Paper is proud to have the largest selection of poly envelopes in the United States! We manufacture the majority of these plastic envelopes in China ourselves. And in each container we import, we are always adding new colors, sizes, and closures to make all of your organizing at home, in school, or at the office, protected and stylish. 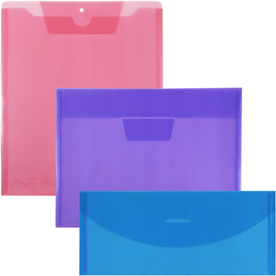 Our Poly Plastic Envelopes are super durable, strong, and long lasting to make your documents as safe as can be. 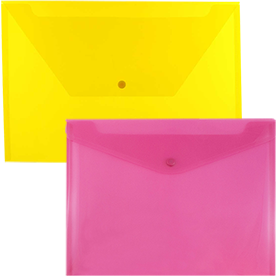 And with our assortment of bright colors and envelope enclosures to choose from, we are sure that you'll find poly mailer envelopes that fits your needs. Our Plastic Envelopes page is super easy to navigate through. We categorize by closures, so once you find the right one for you, it's as easy as clicking that section! 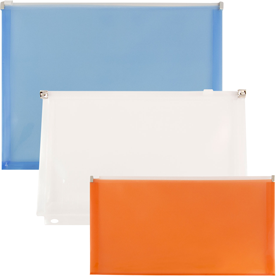 Our Plastic Envelopes with Velcro Brand Closures have the most choices to pick from. We have over 10 sizes to choose from, over 20 colors to choose from, and three different expansion sizes! Get a more classic look with our Plastic Envelopes with Button & String Closure. We have two-tone envelopes, one with dotted patterns, and frosted scratch resistant envelopes available for you! 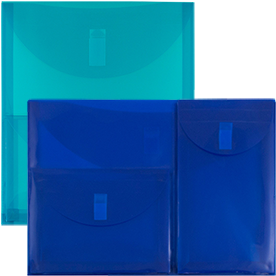 Our Zip Closure Envelopes, also known as storage envelopes and poly zipping envelopes, are great alternatives to pencil cases, and with the awesome expansions you'll be able to store all of your desk supplies inside. 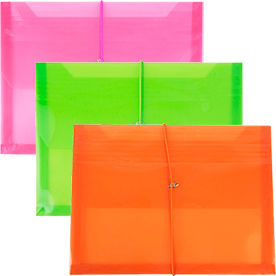 If you can't get enough of our Plastic Protectors, try our Multi Pocket Envelopes. With a two pocket or three pocket choice, we are sure that you'll get as organized as it gets! 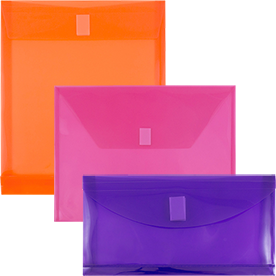 Purchase poly mailers envelopes. also known as expandable envelopes, for the perfect protection.